For Mylai and Si, a young Vietnamese couple hailing from Toronto, having their wedding at this crossroad of life was a simple step forwards for the two of them. With the both having burgeoning careers in healthcare, alongside Si pursuing his masters degree, there was no better time than now to consolidate their relationship and prepare for the future together. 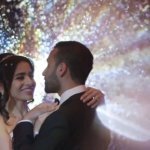 That’s why for us here at SDE Weddings, Toronto’s premier wedding videography and cinematography company, believe that both love and passion can manifest itself fully in both career and craft, a view that’s in no small part echoed by Mylai and Si in their own lives as young professionals. The beloved couples’ special day took place on May 18th, 2014 at the stunningly gallant Sheraton Hotel Hamilton, just a stone’s throw away from Toronto, and as for the reception, featured the Victorian Room at Chateau Le Jardin Event Venue in Woodbridge. Scroll further to read more about Mylai and Si’s elegant wedding and our own experience in helping the couple film every special moment of their day. Our videographers’ work with the couple begins with the ever essential makeup and prep process for Mylai and her bridesmaids, all taking place in Sheraton Hotel Hamilton at the literal crack of dawn. Mylai’s choice of wardrobe for the day would fluctuate between a slimming and stately one-piece wedding gown and a crimson red Ao Dai, a traditional Vietnamese silk tunic. Likewise for Si, a very formal suit would stand in contrast to the traditional garb of the Ao Gam brocade tunic. In many ways, this choice is reflective of Mylai and Si, both cognizant of their heritage, yet well adapted to their lives in a vibrant and multicultural Canada.To accent further the traditional theme pervasive during the morning’s preparations, Mylai and Si would have a tea ceremony with friends and family at Si’s house, as an interlude between the morning and the rest of the day’s events.